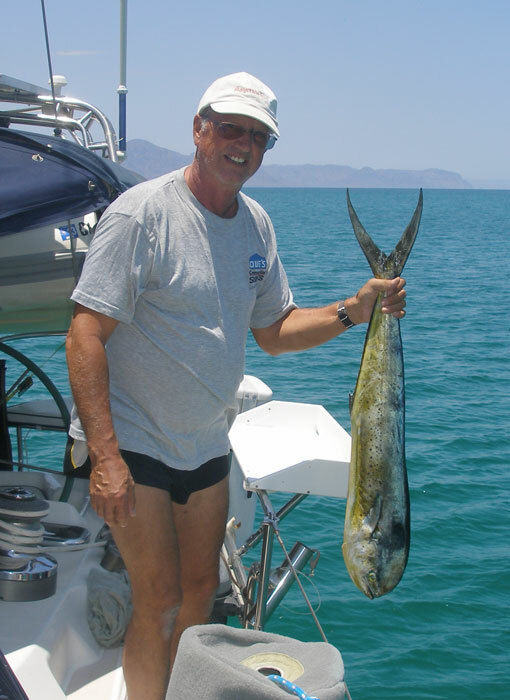 Cuisine Marine – Page 2 – Sailing Mexico and Living It Up! 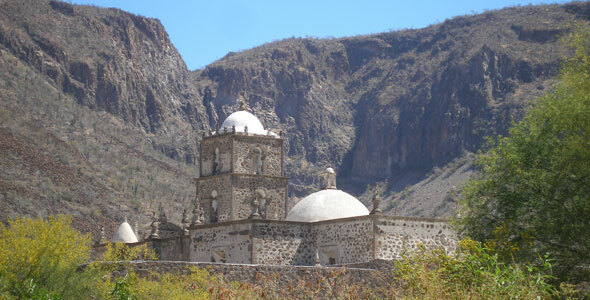 The first mission of the Californias was founded in Loreto. Mission San Javier, slightly newer, is about 20 miles southwest of Loreto and is a lovely site to visit within a small village, tucked into a valley area that is quite remote. It is accessible via a two lane mountain road that is succeptible to washouts during rainy weather. Dena and Dale enjoying the sights with us. Originally populated by native peoples, a jesuit brother visited the area in 1699 and because there was a source of water there, it was deemed as a place to start some agricultural cultivation (and of course some churching). Front view of the church, elaborate altar. The chapel standing there today was built between 1744 -1759. Funny looking dogs are all over Mexico. Dale checks out an ancient olive tree. Search on the www and there is plenty to read about this site, if you want to know more. Field of onions. Architectural detail. Prada approaching a mark. Cetacea docked at Angel Island. Typical windy, foggy, summer afternoon. Prada gets ready to race. Right next to Cetacea's (South Beach) marina. The Adele. She is a beauty. Superyacht Adele was anchored off Angel Island with Tiburon in the background. She is an 180-foot Hoek and in spite of her classic look, was built in 2005. We anchored next to her the last time we sailed in the British Virgin islands (on C470 sistership Beckoning). Helicopter sneaks under the Bay Bridge (there were two of them) . Larry Ellison's Superyacht Musashi, an 88 meter Feadship. Fabulous Picnic! Alison brought cupcakes again! Besides a nice sail around the bay to see the sights, we had a great picnic lunch on Angel Island. Emirates. Another superyacht next to the America's Cup village. We have lots to tell about the last few months, look for a few new posts to come online soon. In the meantime, a short preview photo is shown below. Lots of updates to be done on our spring/summer in the Sea of Cortez. More posts to come. This post is now complete. Here’s some highlights of our many feathered friends. The gulls are pretty comical sometimes and not very shy. We’ve had a few night herons that like to hang around/on Voyager at Marina Palmira. This little guy was hanging around Marina Fonatur in Puerto Escondido, looking for some snacks. There have been lots of babies around this time of year. Before the seagull youngsters turn grey, the littlest ones are white with spots. Every day we get some sort of pelican show. Note above that there is a separate squadron in the back left. The birds are definitely not afraid of boats and we watch out for cormorants and frigates who like to roost on our wind instruments atop the mast (two took a 6-7 mile ride in June), and pelicans and boobies who like to dive on our lures as we troll (one brown booby caught and released so far this season). Brown booby circling Voyager. Frigate hitchhiking on our windex. We saw an amazing bright blue “magpie jay” in town in Loreto recently, sorry didn’t have our camera! Will have to look for him/her sometime again. 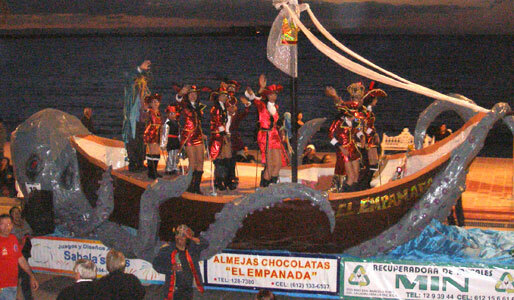 Several cities in Mexico celebrate Carnival. The one in Mazatlan is one of the largest in the world. As we were in La Paz during that time, we decided to enjoy the local scene. Mostly pictures in this post, take a break from reading! 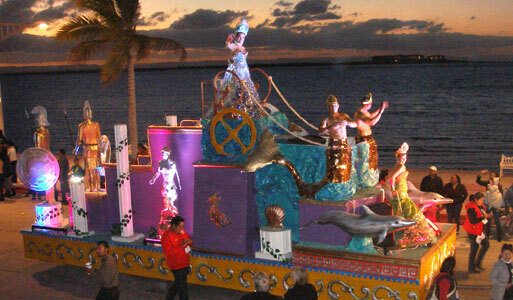 It was especially nice for us that the floats were parked across the street from our marina during the day. They were fun to look at, and were definitely not over-done, lots of hand-crafted feel to them. Balloon vendor looking for customers. A few visitors posed with our friend Bill. 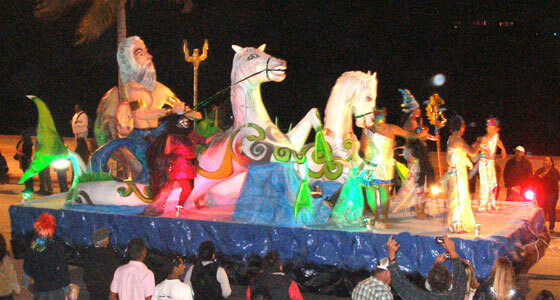 The highlight of the festival is three evening parades along the city’s waterfront (Malecon). The floats had advertising, pretty girls in skimpy costumes, loud music, various dancers, cute kids, and all were designed with an overall marine life/nautical theme. We got a group of 24 friends together and rented one balcony section of a local restaurant for a great view (and good snacks and drinks) – Tailhunter – for the final night of the parade, coincidentally on Mardi Gras. Almost all of us there were alumnus of the Baja Haha 2010 rally. Pretty safe and calm in La Paz for this type of event, no reputation for craziness here. Lots of families out watching the parades and then visiting food, merchandise, and game booths along the waterfront afterwards. Click here to link over to our video page, there are a few movie clips, we especially like the dancing whale shark. If you are Googling for the Baja 1000 rally, this page is NOT it. It has often been discussed among cruisers here, if there is a critical boat part that you really need in Mexico, it can be quicker and cheaper to go back to the U.S. to get it yourself. We tested that theory recently with a drive from La Paz to San Diego and back in less than 5 days. Our boat’s GEL-type batteries had given us 9 years of great life and were starting to act up. Not wanting to spend 4-5 months up in the Sea of Cortez (and mostly unplugged from a dock) without good batteries, we decided it was time to replace them. Over a 2-3 day span while at anchor, we worked up a shopping list of other items to collect while we were up in the states, both for ourselves and a few friends. If we were going to save some money (versus mexican prices) on the batteries, we might as well save some more money by buying other stuff – either things we can’t get in Mexico or can’t bring down on an airplane. Plenty of wide open spaces. Mostly 2-lane road. On Monday we returned to our slip at Marina Palmira in La Paz and made calls to vendors in San Diego to arrange to pick up various items on Thursday or Friday (including a few goodies for friends). A few items (Amazon.com, Garhauer) were expressed shipped to one friendly vendor for collection. On Monday afternoon we traveled to the “Banjercito” office at the nearby commercial port (Pichilingue) to update our boat’s import permit (allows us to bring in parts without duty), and by first thing Tuesday we were on the road. Our only miscalculation was trying to do this all during the Easter “Semana Santa” holiday; every rental car in La Paz was spoken for and if there were any available, they were more than double the usual price. Delaying until after the holiday week would have meant a waste of a week’s marina rental, helping to cancel out our cost savings. Fortunately one of our wonderful cruising friends loaned us their vehicle (thanks!!! you know who you are!!!). As you’ll see in the timeline below, we took two daytimes to drive “up,” we spent about 40 hours in the San Diego area, and two more daytimes to drive back “down” the Baja. If you like to drive you’d probably enjoy the trip. There is very varied scenery … otherworldly geology, farm country, a (very) few scattered views of the Sea of Cortez and Pacific Ocean. Many twists and turns and mountain passes to cross. Almost all of the roadway is two-lane, and is in decent shape for making good speed in daytime (occasional livestock along the road can make it a bit hazardous for driving in the dark). The minimal scruffy bits of the highway (some due to the extreme rains in 2012), didn’t slow us down below 45-50 mph. Many military checkpoints are placed up and down the Baja, makes one feel very secure. There doesn’t seem to be much reason for bad guys to be around. Most checkpoints were more interested in “locals” but we did have to get out of the car a few times. On our southbound trip, a few stations were closed (day before Easter) and all except one waved us on through with no contact. Some of you enjoy a little retail therapy from time to time, which is something we only indulge in while in the states. Most of our shopping in Mexico involves edibles, boat fuel, and occasionally misceallanous boat parts and supplies. Here are some highlights from our shopping list. Keep in mind we could do without some of these things, but as they were convenient to collect, we did. Western Digital video player & HDMI video cable, 13 ft.
We made a short trip to the Bay Area in February. Get the taxes done, pick up a few things, reset our Mexican tourist visas that are only good for 180 days maximum. It’s nice to get back in your car after being away for a while. Even if it’s during wintry weather (no top down this trip). 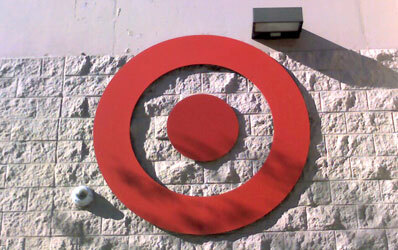 We always have to visit a Target when back in the U.S. They would make a killing in Mexico! And exciting to be able to accomplish so many errands in a single day…versus running around a Mexican town on foot or via bus. Like many cruisers, we get too busy to update our blog regularly. Or we’re lazy. Or both. Take your pick. We wrapped up our two months back in California with a visit to our friends John and Lori in Lake County. We stocked up on some lovely local Chasewater (Kelseyville) olive oil, and of course enjoyed some great California wine! Returning to La Paz in mid-September we were welcomed back by one of several (unusual) rain storms (and an earthquake!). The locals say that the 2012 precipitation was the most to fall here in a generation. Several months later, much of the Baja is still quite green. Puerto Escondido anchorage during Paul's downpour. The darkest colors are the strongest winds caused by the hurricane. We were brushed by the eastern edge of Hurricane Paul in October. At the time, we were tucked securely into the almost fully landlocked Puerto Escondido, just south of Loreto, with our friends on Seychelles, Milagro and Kisasa. Fortunately this was a good spot to be as we had some internet connectivity and could monitor the storm’s path on the web. Voyager at right, the day after the storm. Predicted storm track from the National Weather Service. 40 or so boats shared the anchorage, including about six large sportfishers who left the marina docks there to anchor (more securely at this location) out with us. One large commerical fish boat also came in from the Sea. At one point the storm was predicted to cross the peninsula into the Sea of Cortez but never did, instead remaining on the Pacific side of the Baja. We saw a few gusts only into the low 40s and there was about 10″ of rain over a two day period. (left image) Waterfalls after the rains. Green mountains over Pto. Escondido. We have changed the location of Voyager 152 times. We have run the engine for 810 hours. We have covered approximately 5,264 miles. We have spent 375 of 730 nights in marinas (51%). We have taken four trips (flights) back to the U.S., about 90 days away from the boat. Departing Puerto Escondido, derelict boat being towed. http://www.lapazninos.org/ they have a donation button on the left side of their page. For any donations between now and December 31, the donation will be matched if the donation is made through International Community Foundation (click on this link). Former cruiser Pete (88) and some of his fan club, they must keep him young! Twenty-six years ago, a couple of cruisers (from the San Francisco Bay Area!) decided to get off their boat and settle in La Paz. Wanting to be a full part of the community they enjoy, they saw a need to give an extra hand to children in some of the more modest (to be politically correct!) 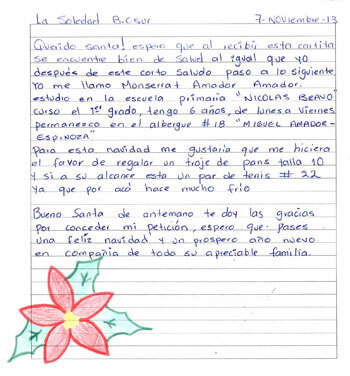 communities in the area by helping to found FANLAP – Fundación Ayuda Niños La Paz (foundation helping the children of La Paz). Attending school is not as common here as it is for U.S. kids, especially for low-income families with multiple children. Besides having enough good food to think straight, school kids need uniforms, shoes, supplies, tuition money for high school, and even bus transportation (not free!). We recently visited FANLAP’s modest building in Colonia Laguna Azul on the northeast side of La Paz where kids can come in for a free lunch after school, around 2:30. Prepared by a volunteer group of mothers from the neighborhood, about 150 kids from elementary through high school age are fed on each school day. Most of the cruising community helps out by participating in the annual SUBASTA (Auction) which is a major fundraiser for FANLAP. Held the first Sunday every December, there is a big rummage sale (lots of U.S. and Canadian donated household, boat and clothing items that are purchased by local residents), a raffle, live and silent auctions that include boat supplies/services and certificates for hotel/restaurant visits. Several local food and crafts vendors attend and donate some of their proceeds. Several of the scholarship kids help out at the event or do chores/maintenance at the dining/library facility in exchange for their support from FANLAP.